February 13th, 2015 | Wheaton World Wide Moving. Since we are all feeling the love on this Valentine’s Day, we are looking at what makes Wheaton World Wide Moving a preferred interstate van line. Receiving feedback via our survey, the Customer Experience Report (CXR), speaking to customers on a daily basis and analyzing the journeys our customers make during every step of the move process reveals to us what customers believe sets us apart from our competition. Four in ten customers pick Wheaton World Wide Moving because they have used us before and had a positive experience, or they have been recommended by someone they know and trust to hire Wheaton for their move. This is our largest segment of customers and this percentage has increased significantly over the last several years, so our customer loyalty is ever growing. Our drivers are the heart and soul of every move. Not only do drivers spend weeks driving around the country with household goods, they also help coordinate the helpers and communicate with the corporate office about scheduling. Customers consistently rate our drivers with high marks. More than nine in ten customers indicate in their survey that they would choose to have their exact same Wheaton driver move them again for their next move! “Joe Lewis was our driver during pickup and delivery. He is absolutely a fantastic leader,” said Jerry and Kathy in Wake Forest, N.C.
One of the first interactions the consumer has with the van line is through our salespeople. Our salespeople are known for the professional attitudes, yet friendly, family-like demeanor. This is another leverageable strength of Wheaton’s. Approximately nine in ten customers have very favorable perceptions of our salespeople’s courtesy and professional service. 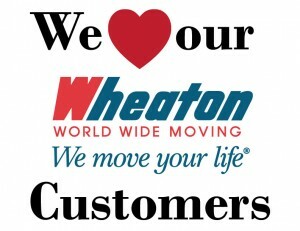 This service promotes trust and confidence in our customers that Wheaton can reliably and effectively handle their moves. Customer feedback and statistical analysis of our survey data reveal communication is biggest driver in shaping customer perceptions of Wheaton. Communication and great customer service makes the difference between a good move and a great move. Since proactive and accurate information is so important to our customers, we are constantly reviewing our processes to improve our communication with them. Our goal is to exceed expectations with every move. With that goal in mind, we are constantly reviewing the customer experience through the CXR and other feedback mechanisms platforms for ways to improve the process and make it as stress-free as possible.